In 1974, Queen were still something of a "cult" band. One (comparatively) minor chart hit in "Seven Seas Of Rhye" had brought them to people's attention and this, my personal favourite Queen album, still slipped under the radar in comparison to later works. Lyrically, fairies, queens, dragonflies, ogres and the like were still prevalent and the music the mixture of "heavy" and piano-driven melodic delicacy that we had been introduced to on their 1973 debut album. There was, thankfully, no of the 1920s-style Mercury foppery that, in my opinion, so blighted "A Night At The Opera". "A Day At The Races" and, to a lesser extent "Sheer Heart Attack". Give me white queens and ogre battles to lazing on a Sunday afternoon. 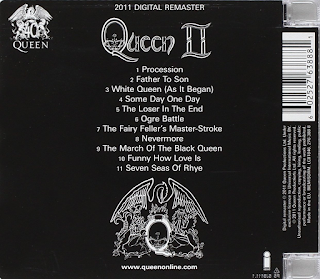 A strange choice to make when assessing a "rock" band's music, but the "heavy" bits on "White Queen", "Father To Son" and "Ogre Battle" win out and make "Queen II" a very credible album. 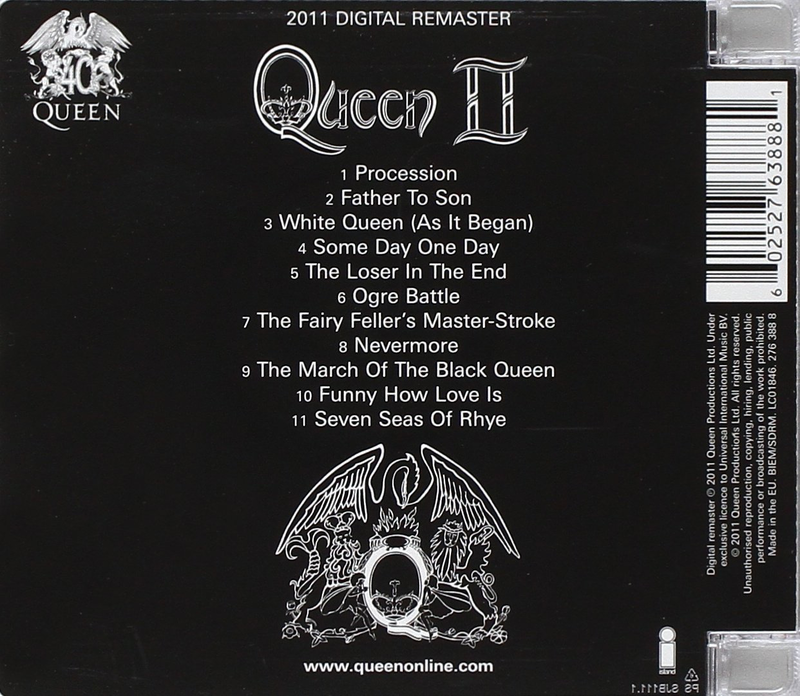 Despite the appeal of "Father To Son" and "White Queen" as openers, the ethereal "Some Day One Day" and the completely incongruous "Taylor track", "The Loser In The End", (written by drummer Roger Taylor) where he regrets allowing his mother to wash his clothes for him in his youth, it is the old "side two" that steals the show. Segued as one complete whole, "Abbey Road" style, we get one Queen classic after another - the afore-mentioned "Ogre Battle"; the artist Richard Dadd-inspired lyrical wonder of "Fairy Feller's Master-Stroke"; the beautiful but brief "Nevermore" leading into the tour de force and forerunner to "Bohemian Rhapsody" that is "March Of The Black Queen" (in many ways I prefer it to "Rhapsody"). 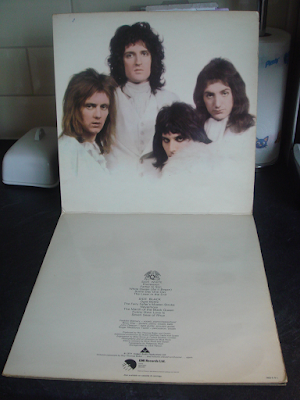 Then it is the harmonious "Funny How Love Is" before the single "Seven Seas Of Rhye" signs off to what is, in my opinion, the finest twenty minutes in Queen's career. 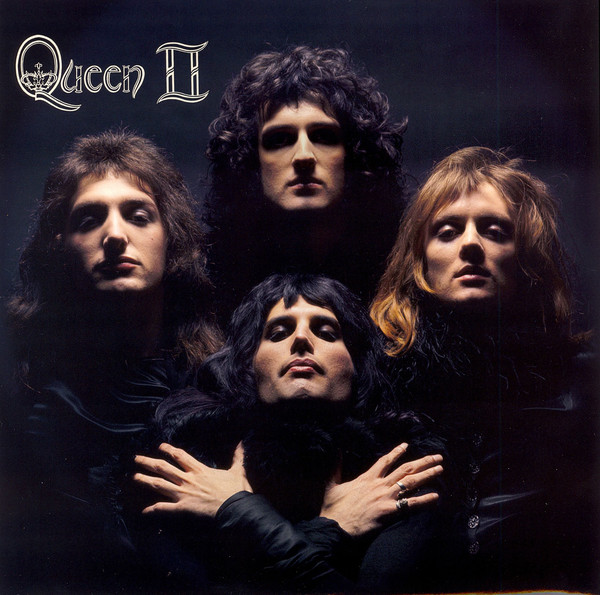 "Queen II" is proof that Queen weren't always the "singles band" that some later albums unfortunately suggested they may be.